It was fantastic, ... I couldn't ask for a better meet as far as the competition goes and the crowd. This was fun - the kind of stuff that keeps you rejuvenated and keeps you young. You're exhausted, but you don't think about it. You just go out and swim. It's a great meet. Nobody wants to go home. 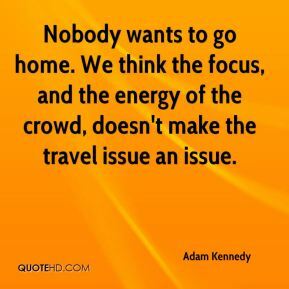 We think the focus, and the energy of the crowd, doesn't make the travel issue an issue. 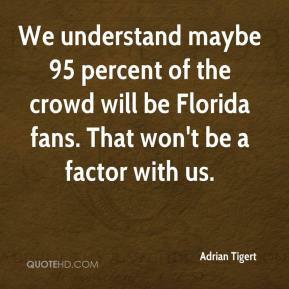 We understand maybe 95 percent of the crowd will be Florida fans. That won't be a factor with us. 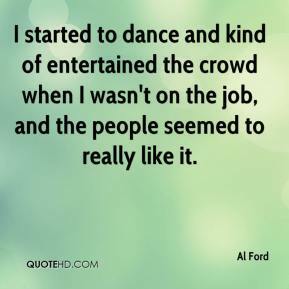 I started to dance and kind of entertained the crowd when I wasn't on the job, and the people seemed to really like it. I'm sure they're going to crowd the box and not give much respect to our passing game. The first win was a much bigger deal (than the first TD pass). 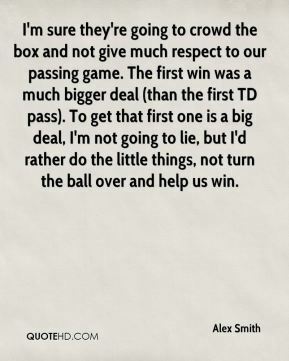 To get that first one is a big deal, I'm not going to lie, but I'd rather do the little things, not turn the ball over and help us win. Our tactics were successful. We played counter-attacking football. The Turkish crowd for their part were great. 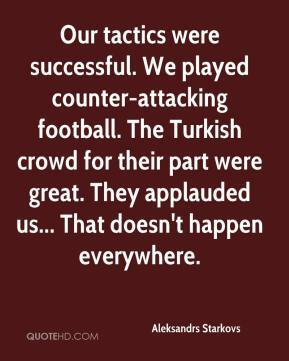 They applauded us... That doesn't happen everywhere. 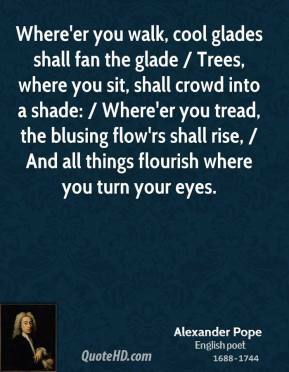 Where'er you walk, cool glades shall fan the glade / Trees, where you sit, shall crowd into a shade: / Where'er you tread, the blusing flow'rs shall rise, / And all things flourish where you turn your eyes. 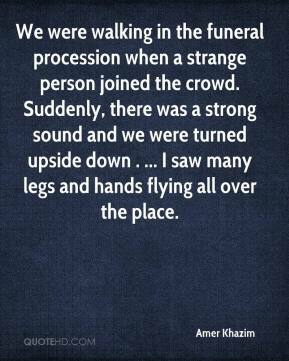 We were walking in the funeral procession when a strange person joined the crowd. Suddenly, there was a strong sound and we were turned upside down . ... I saw many legs and hands flying all over the place. I sort of fell in with the wrong crowd. 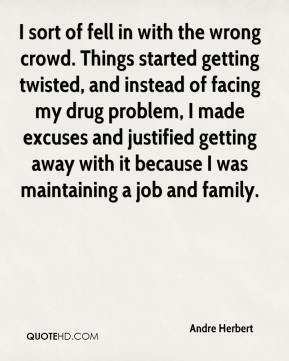 Things started getting twisted, and instead of facing my drug problem, I made excuses and justified getting away with it because I was maintaining a job and family. 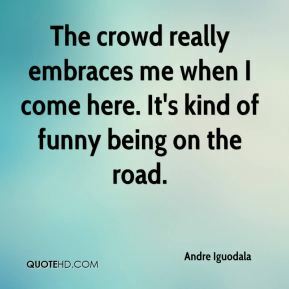 I think the crowd embraces me when I come here, which is kind of funny, being on the road. But I felt real comfortable coming into the game. 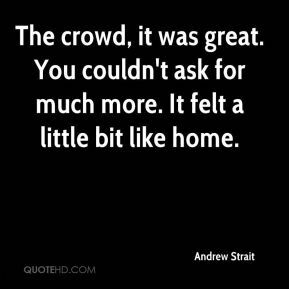 The crowd really embraces me when I come here. It's kind of funny being on the road. 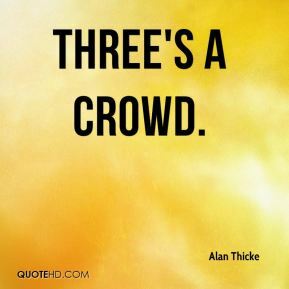 It was a very mixed-up crowd. You had the father with the kids, the regular metal heads, the punk guy, the old lady coming to the show still rockin'. 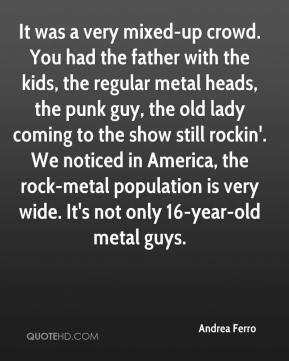 We noticed in America, the rock-metal population is very wide. It's not only 16-year-old metal guys. The crowd, it was great. You couldn't ask for much more. It felt a little bit like home. 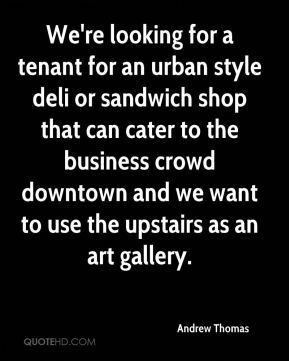 We're looking for a tenant for an urban style deli or sandwich shop that can cater to the business crowd downtown and we want to use the upstairs as an art gallery. 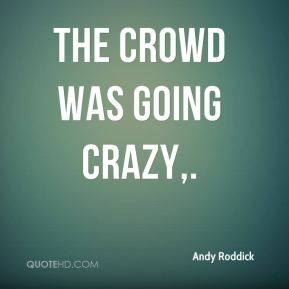 I'm gonna play off the crowd, have fun and just go with it. 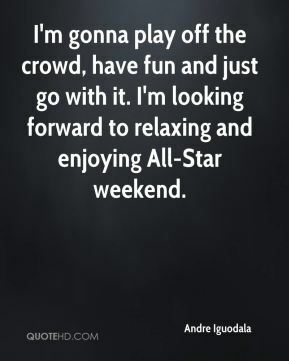 I'm looking forward to relaxing and enjoying All-Star weekend. 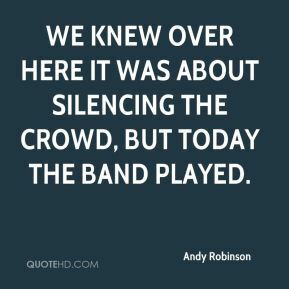 We knew over here it was about silencing the crowd, but today the band played. 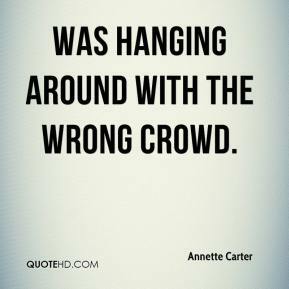 was hanging around with the wrong crowd. You want to make those saves when the whole crowd is focused on you. I was happy to make them for the fans. They were excited and I was excited we could get the win that way. [When a man speaking broken English pushed through the crowd yesterday, excitedly asking,] Are you the mayor? ... From your mouth to God's ears. I'm Anthony Weiner. I'm running for mayor. I hope you vote for me Tuesday. 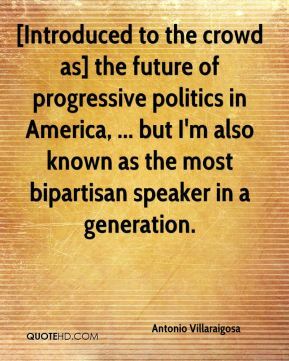 [Introduced to the crowd as] the future of progressive politics in America, ... but I'm also known as the most bipartisan speaker in a generation. I was going to after-Oscar parties. I was mingling with the Hollywood crowd. 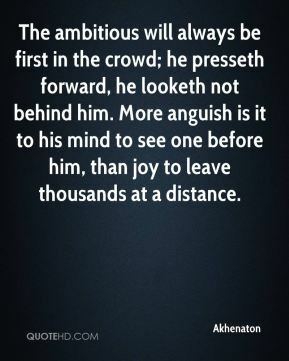 It's really easy to become distracted when you have opportunities to do that kind of stuff. 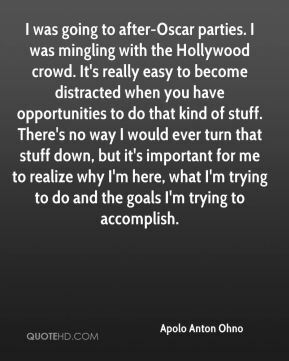 There's no way I would ever turn that stuff down, but it's important for me to realize why I'm here, what I'm trying to do and the goals I'm trying to accomplish. 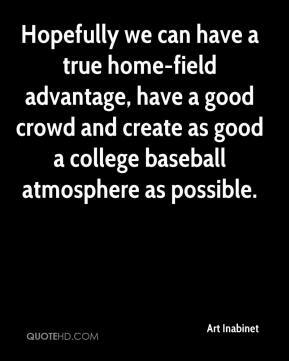 Hopefully we can have a true home-field advantage, have a good crowd and create as good a college baseball atmosphere as possible.